According to legend, while Adi Shankaracharya was walking by the Tunga river, He saw a cobra with a raised hood, providing shade from the hot sun, to a pregnant frog in labor . Mesmerized by the sight and overwhelmed with the place where natural enemies live in harmony, he stayed here for twelve years and is said to have selected the site as the place to stay and teach his disciples. Sringeri is a picturesque town located at the foot of the Sahyadris (Western ghats) mountain range situated at an altitude of 2789 ft in the banks of river Tunga. The place is rich in vegetation and has a very pleasant climate. The ever green forests and the sacred river Tunga have made this town a lovely abode of nature. 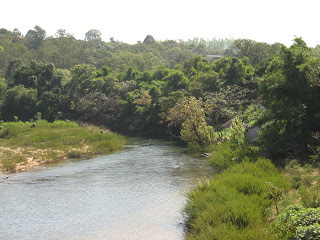 The river Tunga is 147 km long and merges with the Bhadra River at Koodli. The water of this river is sweet and crystal clear. In the temple Goddess Shree Sharada Devi is seated on the Sri Chakra Peetham, holding a Japa Mala, with a parrot perched on the top of her hand. The original sandalwood idol that was installed by Adi Sankaracharya, was later replaced in the 14th century with a golden image by Shri Vidyaranya (Sri Vidyaranya coming five centuries after Shankara Bhagavatpada was the 12th Jagadguru of the Sringeri Sharada Peetham from 1380 to 1386 A.D). Vidyashankara temple was built in commemoration of the pontiff Vidyashankara, around 1357-58 A.D. This temple combines the Hoysala and Dravida architectural features. It stands on a richly sculptured basement. The wall recesses in the temple have a number of sculptures from Hindu, Buddhist and Jain mythologies. Inscriptions in the temple record contributions made by several Vijayanagara emperors but the temple was probably built on an earlier Hoysala site as it combines Hoysala and Vijayanagara architectural features. Among the many intricate carvings, lions that are engraved on the pillars with growling faces have stone balls inside their mouth and they can be moved inside their mouths. There are six doorways leading into the temple. The twelve pillars in the mandapam are named as the Raasi pillars or the Zodiac pillars from depicting the signs of Aries to Pisces., and are so arranged that the sun's rays fall on each of them, in the order of the solar months.This is an exhibition of the astronomical expertise of medieval south Indian temple builders. •Chandramouleeshwara Pooja by Sri Jagadguru : 8.30 P.M. Guest houses are available near the mutt.Advance booking of the guest house is not entertained. For the requirement of Guest House, Pilgrims can approach the Information Office located adjacent to Sri Sharada Temple main entrance.You can also stay in Udupi or Mangalore if you are planning for a day's visit only. Though I do not want to carry an advertisement, I will deprive the readers of a good food if I do not mention Sri Maruthi Bhavan just outside the temple entrance arch in the main road. It is a homely place and people stand in queue and await their turns to enter into this small restaurant. You may have to sit on the floor though and hot iddlys and crispy vadas are served as many as you require. There is no billing system and you have to declare the quantity and pay the bill to cashier on your way out. Inside the math and the temple premises food is available in abundance. Annadhanam is a regular feature and devotees who visit the temple should not miss the food. To cater the need of devotees a big dining hall namely ‘Sri Bharathi Theertha Prasada’ has been built near Sri Sharada Temple. Nitya Annadana is served to the all devotees in the afternoon and night between 12.15 P.M. and 2.30 P.M. and 7.15 P.M. and 8.30 P.M. respectively This Nitya Annadana consisting of a full course hot meals from delicious sambar to buttermilk is served for almost 7500 people. Separate halls for orthodox Brahmins is available. 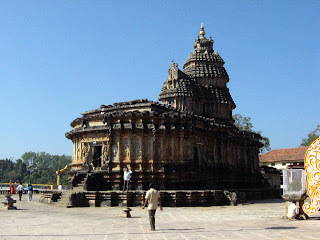 Sringeri is situated at a distance of 324 Kms from Bangalore, 95 Kms from Mangalore and 100 kms from Udupi. Government bus services from major cities and towns such as Bangalore, Mangalore, Udipi, Shimoga connect Sringeri . Nearest railhead is at Udupi, which is connected by rail to Chikmagalur and other major cities in south India. Taxi cabs are available from Udupi to Sringeri and they used to charge around Rs 1,000. If you drive your own car or planning to hire a taxi, do not plan for a late evening drives. It is not very safe according to the local people there. Sringeri Math is providing wheel chairs for the physically challenged and aged people on returnable basis. This fold able wheel chair can be collected from the Information Centre at Sringeri Math for free of cost and returned after Darshan. 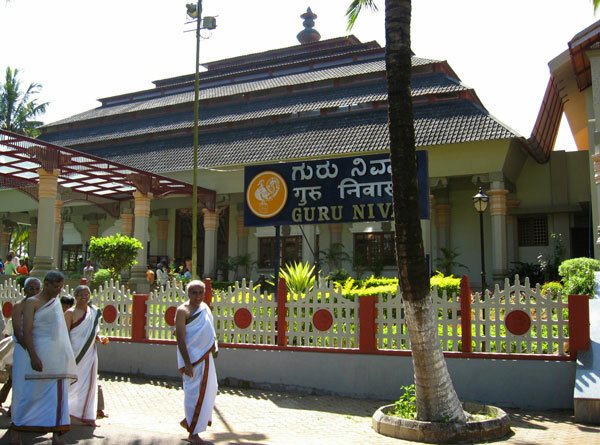 Sringeri is a place that can be visited throughout the year due to its general cool climate. Sri Vidyashankara and Sri Torana Ganapati Temples 7:00 A.M. to 1:00 P.M.and 5:00 P.M. to 8:30 P.M.